The Herald of Savathûn, Proxy is the main boss of the adventure Bug in the System. It is killed by The Guardian in a simulation within the Infinite Forest. 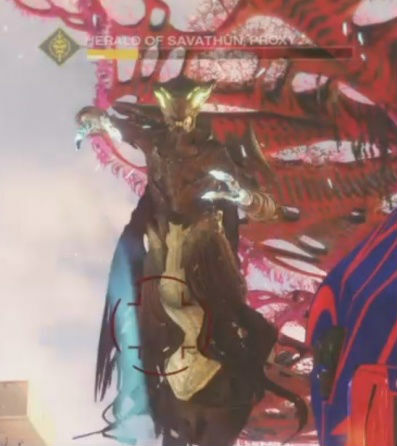 After killing the second wave of simulated Hive, the Herald of Savathûn, Proxy and two Revenant Wizards will spawn in the front of the area of the past. Additionally, numerous adds, mainly Thrall, will also spawn to overwhelm the player. The Ultra will fly around the area, blasting at the player. Killing the Proxy will end the adventure, rewarding the player with loot and Glimmer.